My father, who was born in 1900, had three wives over his lifetime. His first wife was a lady in France and I believe that they had one son (but I never confirmed that). I believe that they divorced but I never found any paperwork. He married my mother in 1933, they had only one son (me) born in 1945 but they divorced sometime around 1962-3. we lived in Newton, Massachusetts. I have a son and a daughter. My son actually has the clarinet that my father used in Paris. After his marriage to my mom ended, he married Sandra Lee Robinson, as you mentioned, and they moved to Marshfield, MA. He passed away from cancer in 1966. By the way, his third prize that he received from the Paris Conservatory of Music was for Solfeggio. My father helped start and taught double bass at the Tanglewood Music Festival. My father was very close to Serge Koussevitsky and his funeral took place at the same location as did Koussevitsky’s. My mother, Naomi, was very close to Leonard Bernstein’s mother who invited her to attend the John F Kennedy Center for the Performing Arts, in Washington, public debut on September 8, 1971. There she met Michael Tilston Thomas. My parents were also close to Lou (Gino) Cioffi, Tiny (Leslie) Martin (a jazz bassist) at the BSO, Aaron Copland, and others at the BSO, Boston Conservatory of Music (where he taught) and, of course, the New England Conservatory of Music. There are many names that I remember but it was so long ago that its hard to connect with them. This is my first time dealing with a blog. I hope that this information helps and, at least, gives a better (but not complete) picture of my father’s private life. Thanks for your comments! This is written for his son, Peter Moleux. Georges E, Moleux was the Principal double bass of the Boston Symphony Orchestra for many years . In addition to winning First Prize in Double Bass at the Paris Conservatory, he also won first prize in clarinet. I was a member of the New England Conservatory Concert Band when I was a kid in High School. I went to Brookline High School from 1947 until 1951. I had begun the clarinet with Normn Carrel(whose real name was Cohen) who had been the Principal in Houston for several years and came back to Boston to teach at the New England Conservatory. He had the most beautiful sound I have ever heard and he taught me his sound and I think his great love for the instrument. (Norman was also a very gifted cartoonist, having written several excellent books of cartoons, mostly of clarinetists in trouble< I am searching for those books) It was Mr Carrel(as I called him) who suggested that I play in the NEC Concert Band, which met every Saturday morning and was filled with all of the clarinet students of the Conserstory , who were all better than I was, by far. Many were to be big names. in that band, which Mr Moleux organized like the Garde Republican Band in Paris, more like an orchestra, with 40 clarinets, 20 firsts and 20 seconds, as violins are in an orchestra. And we played orchestral repertoire, for the most part. At one of the first rehearsals, we were playing Le Coc D’or Overture by N. Rimsky Korsakov. I saw some smaller notes on the page and played them. Big Mistake, as I told that ths was the Cadenza to be played by only one clarinet. Terribly embarrassing, but you know, I got to play that part many times as principal clarinet in many orchestras. It was at one of the rehearsals that he told the band about his two first prizes. Then as we looked in wonder, he solfegged (sang the musical syllables) of the Flight of the Bumblebee, at the correct presto tempo. I never did that, nor have I heard anyone else do that, ever. So, that was what I knew about Mr. Moleux. He was treated as a god by that band of professionels-to-be, and it was a fine and building experience for all who played, included the dumb kid who played along with the first clarinet in the Cadenza. Looking for the Biographical material on Georges Moleux, it is really almost impossible to find anything of real importance. His is simply name on literally hundreds of recordings , as he recorded with the finest String Quartets of the day when they used Double Bass, the Budapest Quartet is but one, and he was the couble Bass of the very famous recording, conducted by Leonard Bernstein, of the Stravinsky Octet and L’Histoire du Soldat, still a definitive recording. I know that while I was a student at the Conservatory he married a bass student. He was also the teacher of many other students, one of them being Buell Neidlinger, recognized as the finest Jazz bassist, who also played for several seasons with the Boston Symphony. To get an idea of the virtuosity of Georges Moleux, remember that Serge Koussevitsky, the Conductor of the Boston Symphony was himself a virtuoso Double Bassist, who toured the world prior to becomeing the Director of the Boston Symphony. Certainly as the person who undoubtedly auditioned his replacement, he would have picked a virtuoso. That was Georges Moleux. Ispentlast evening looking for biographical refrences for Georges E. Moleux, and finally just constructed what you see above. Very little is to be found andI guess it was because he was very busy, he payed beautifully, was a great teacher, with a wonderful sense of humor. Perhaps someone will use this little piece as a reference. The notation, by Mozart of the Famous Trio with Viola, Clarinet and Piano is exact and repeated throughout the first movement until the concluding bars.The notation is in 6/8 time, marked Andante and has within the bar what is apparently a turn, written out and coming on the last half of the third and the 6th beat of the bar, throughout the movement. Yet,most every ensemble playing this piece will change the notation to that of a simple turn, which is alWays played in a most rubato fashion and never performed as written. If played as written the tempo implication is of a much slower tempo, indeed 6/8 in andante, at approximately at 72 mm for each eighth note. This implies three movements of different tempi, the first slow and stately, the second in a menuetto tempo, and the last in a moderate 4 beats to each bar. without Mozarts notation and tempi,the works becomes three movements of medium tempi, the tempi being almost the same. So,on May 6, we played this beautiful trio with the corrct tempi. Who is the authority? 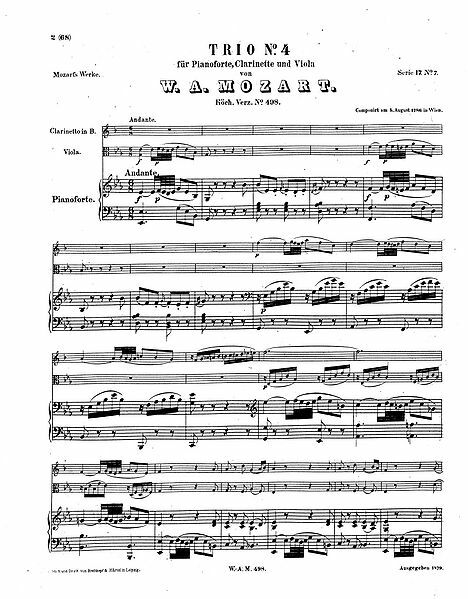 Poor Mozart is the one and only , the composer.For those of you who may be contemplatin this work consider the implications of Mozarts notation. As the years have past, I have noticed the clarinet in my hands, more and more. It became important as a youngster. In the US Army in the 50s, I used to spend many hours practicing in the basemant of the band rehearsal room, mostly long tones, mostly standing. One of the duty sargents came in one day a little “out of it” and asked me to show him my hands while I played. I did and he felt for the hardness above both thumbs which held the clarinet. He said, “very good”, as he said it was important to develop those muscles and even more important to practice everything standing. I followed his advice and for many years played endlessly while standing. I learned to consider sitting and playing somewhat of a weakness, and never ever rested the clarinet on my knee while playing. (this actually changes the pitch of the middle B, as it wil alway be higher held off the knee) That was my thing , and I cannot remember ever feeing fatigue from playing standing. As the years past I began to experience a slight pain in my left hand. This particular discomfort finally became painful enough to really get my attention. I found that I had what is known as DeQueurvains syndrome. (named after the surgeon who discovered it in 1895) Ilearned that there was a relatively simple procedure which would cure this really awful pain and tenderness. I saw a plastic surgeon at the Montreal General and he told me that for whatever reason , by making a small incision about an inch below the left thumb, almost painless, no anesthetic , a scar would be formed within, and as it healed, the scar tissue would provide enough room for the tendons to move freely. While it was a concern, all turned out quite well and as he said, “you are cured” and truly, I was. No more braces and straps to support my wrist, no more left hand blips. (there is one on one of my records, of the Brahms Trio, but only one. So, life went on and I continued playing many many concerts in and around . Then later, I started to have pain in my right hand. First, I started criticizing thumb rests, and I was quite critical of most of them, for they are not made for sore wrists. There is only one thumb rest which is ideal and that is the one on my Amati C Clarinet. It is perfect, located correctly and really quite helpful, but it wasn’t enough. I think I had the same condition in my right hand, and really did not feel like repeating the same procedure. Still there was a solution and that is the clarinet neck strap. Using that, with the Amati C clarinet and playing the C, which is smaller, weight is diverted from the right hand as you use the strap and it must be said that the Amati thumb rest with its angled strap attachment is very well thought out. This, I really recommend.. I have two Amatis, the C and a full boehm Bb, which is also excellent, thought much too heavy for me. So last Sunday, we played the Mozart Trio K498, using the C clarinet. The part is almost as simple as is the Bb part, and the sound is superior, as is the tuning. Amati is a strangely unsung instrument, little advertised, perhaps even scorned by some, but they seem to know what they are doing. There is only one thmb rest which is ideal and that is the one on my Amati C Clarinet. It is perfect, located correctly and really quite helpful, but it wasn’t enough.As mentioned, I think Ihave the same condition in my right hand, and really do not feel like repeating the the same procedure. Still there was a solution and that is the clarinet neck strap. Using that, with the Amati C clarinet and playing the C, which is smaller, weight is diverted from the right hand as you use the strap, and removed from the right hand, resulting inmuch less strain and worry. Amati is a strangely unsung instrument, little advertised, perhaps even scorned by some, but they seem to know what they are doing. Thank you, Amati, beautifully made in Czechoslovakia. keep practicing. It’s never too late. You are currently browsing the Sherman Friedland's Clarinet Corner blog archives for May, 2012.